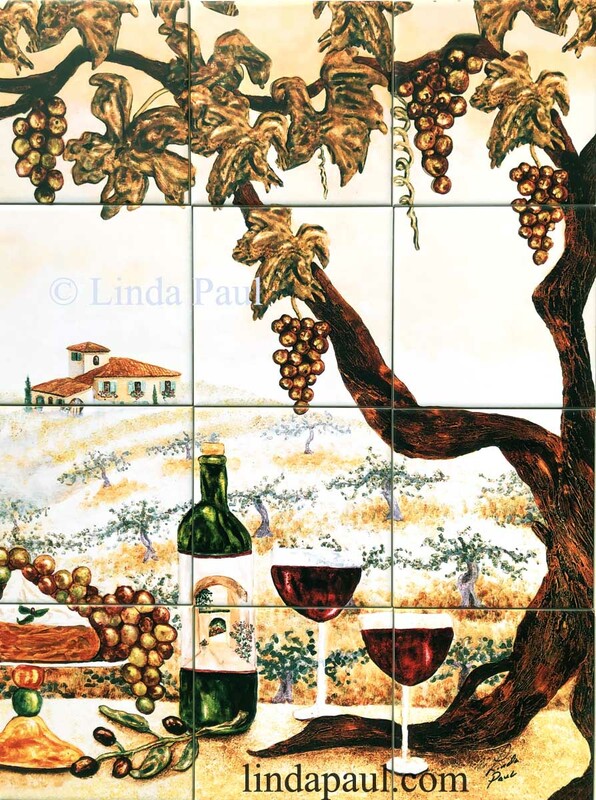 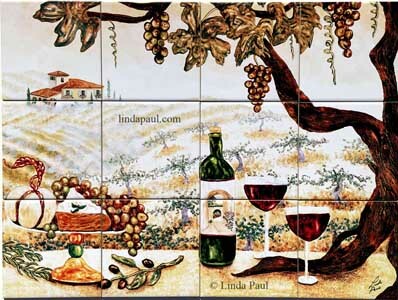 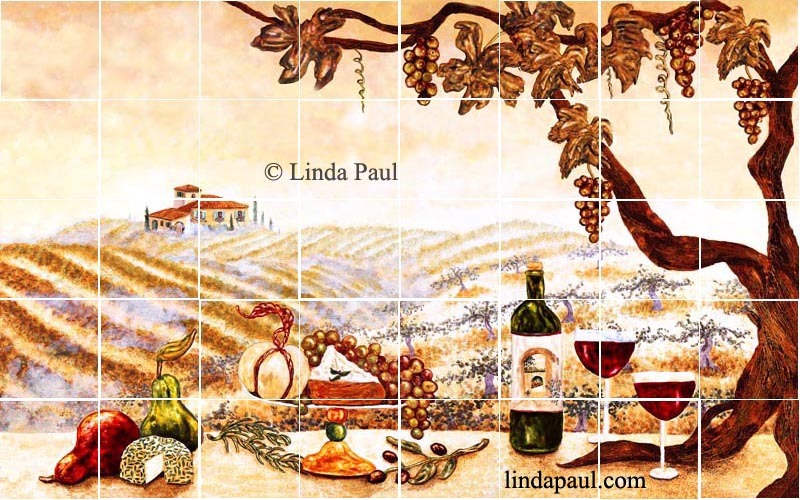 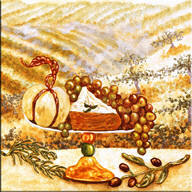 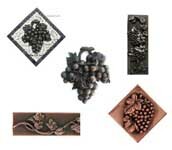 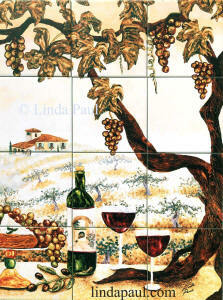 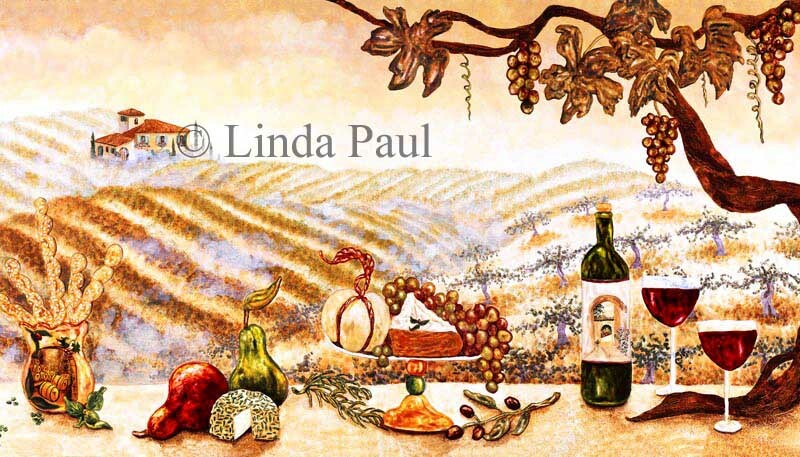 Beautiful backsplash tile mural of Tuscan vineyards, wine bottles, wine glasses, grapes on the vine, pears, cheese, rosemary and Italian villa. 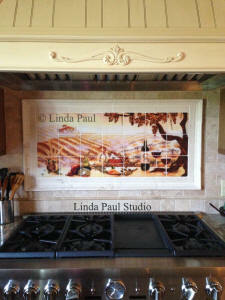 Made with heart and soul in my Colorado art studio. 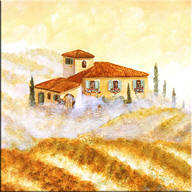 Artist's Inspiration: I love misty mornings in the vineyards. 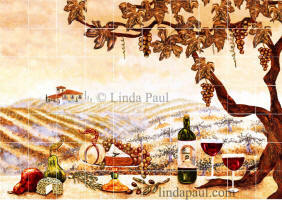 Whether in California, France or Italy there is something magical about the mist hanging in the grape vines. 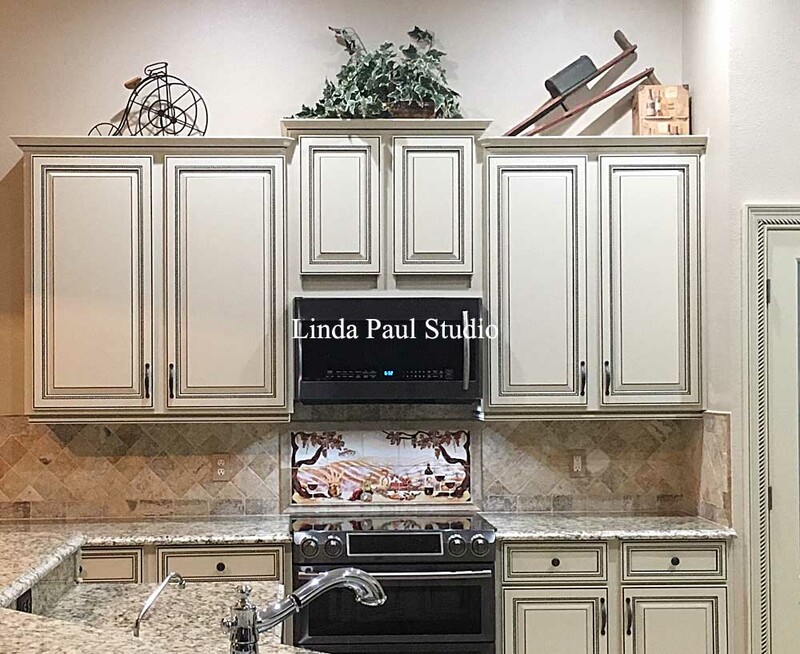 Its all so perfect and still. 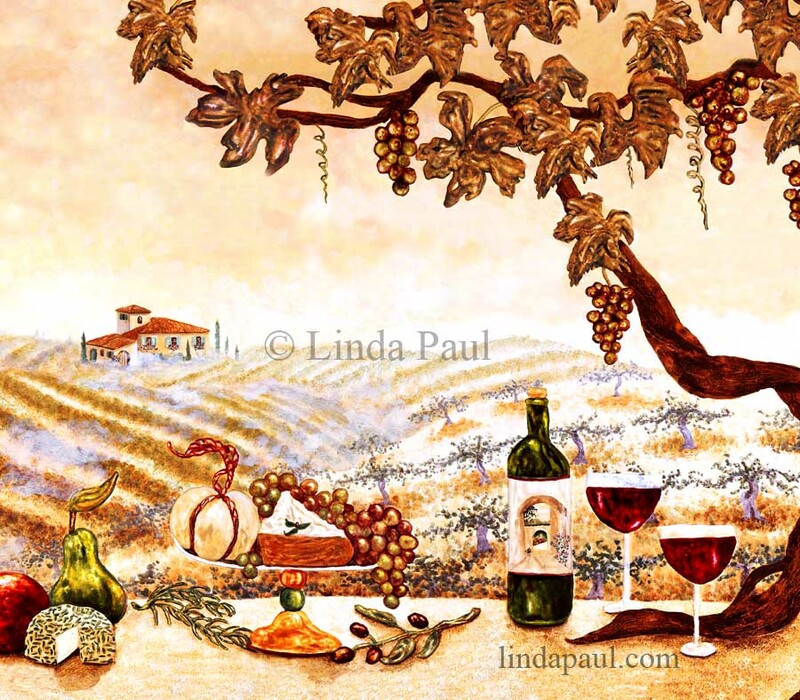 I wanted to capture that feeling in this wine still life and vineyard landscape. 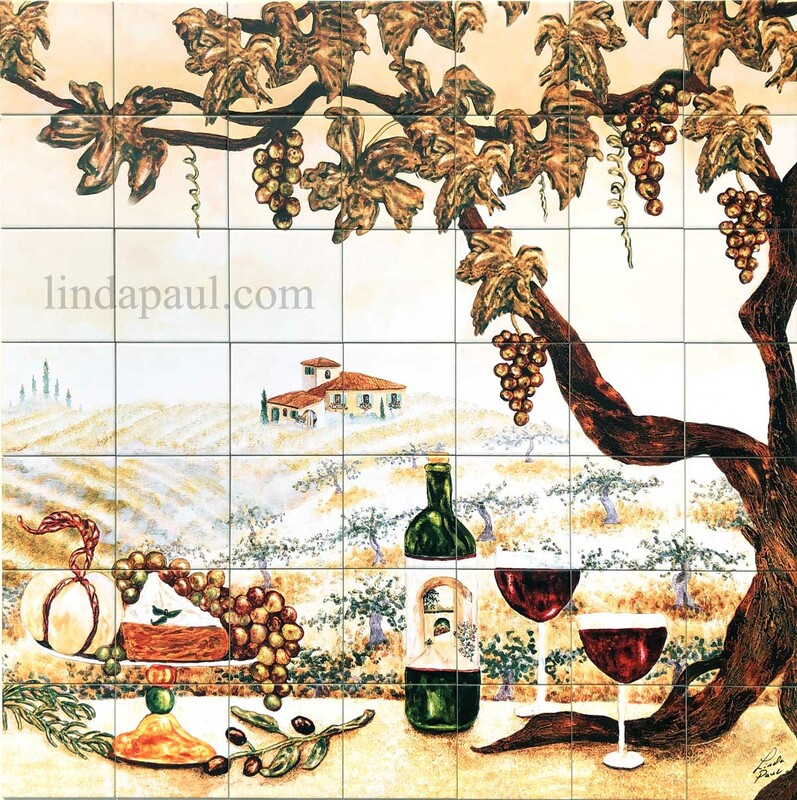 The pottery holding the breadsticks has a miniature painting of a wine cellar. 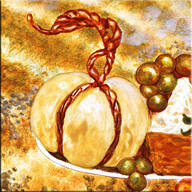 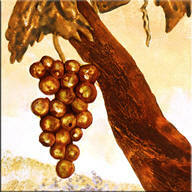 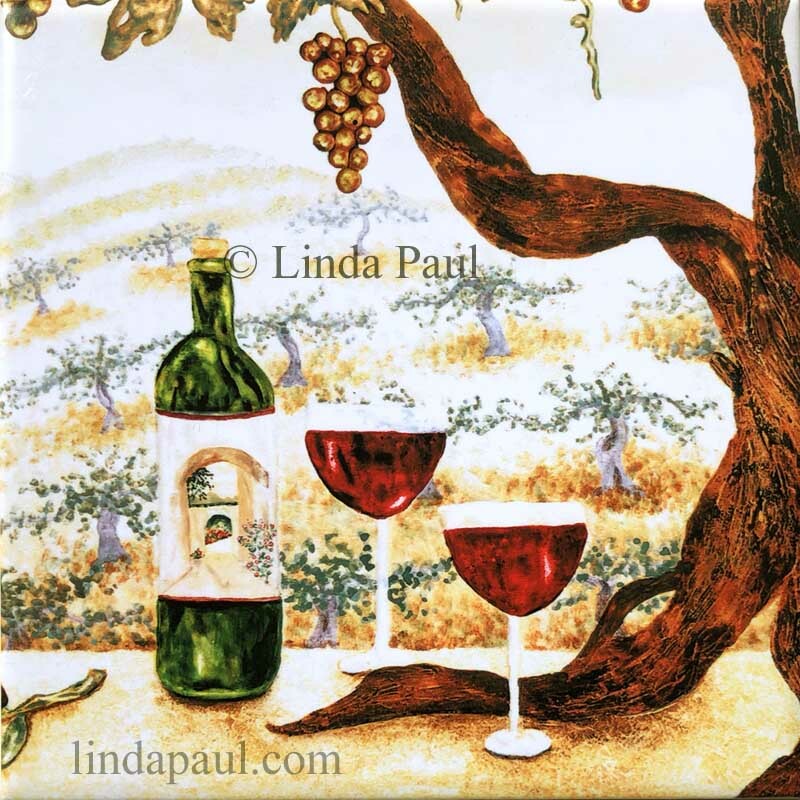 This artwork is perfect for wine and grape kitchen decor! 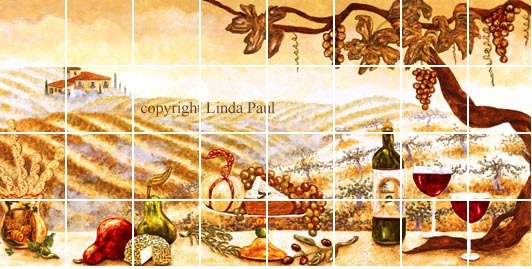 Artist Linda Paul. TThe Vineyard Version C with extended sky and grape leaves. 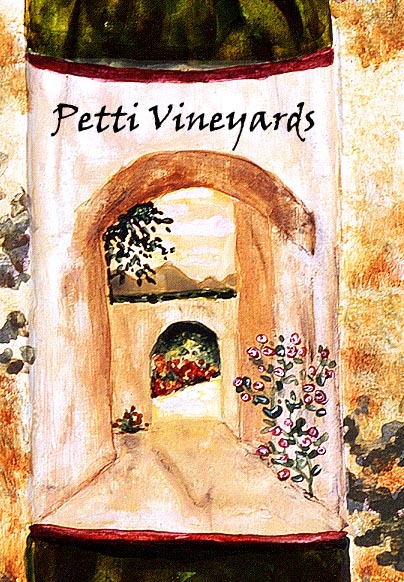 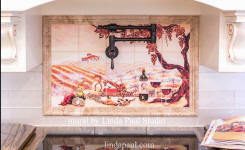 We created a wow factor for our customer with a 42" x 24" tile mural of The Vineyard. 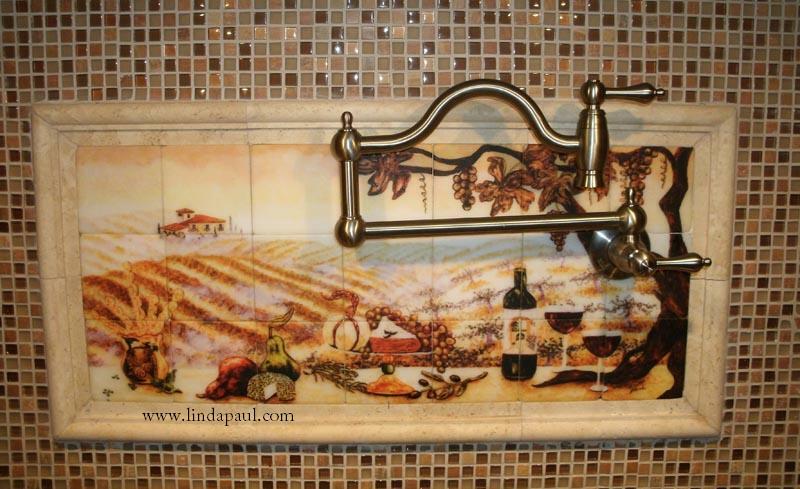 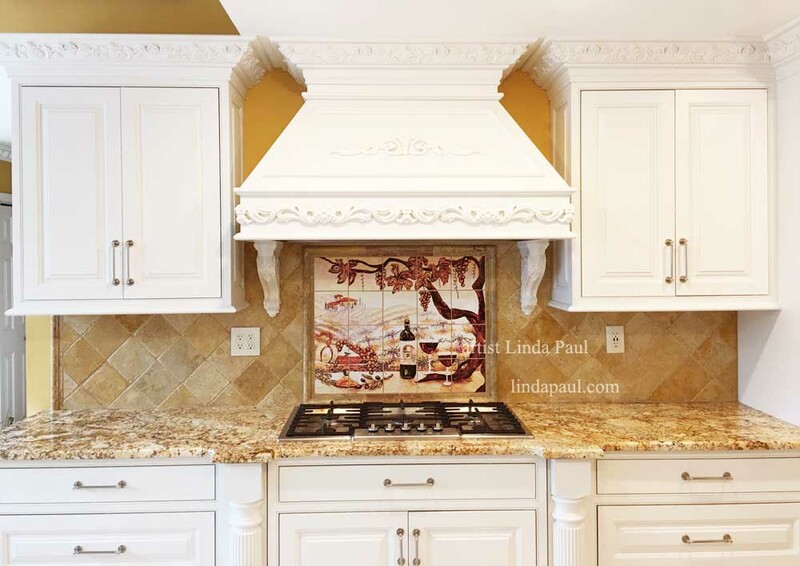 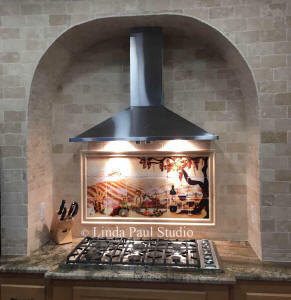 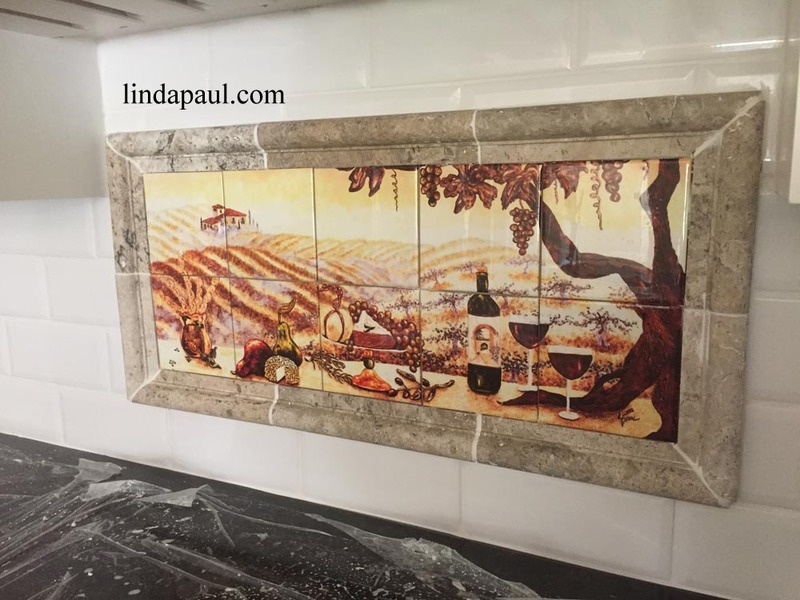 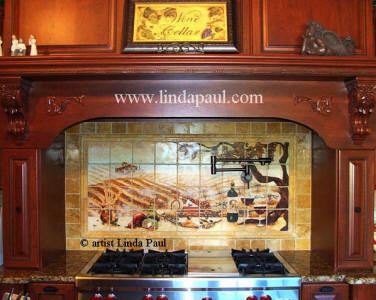 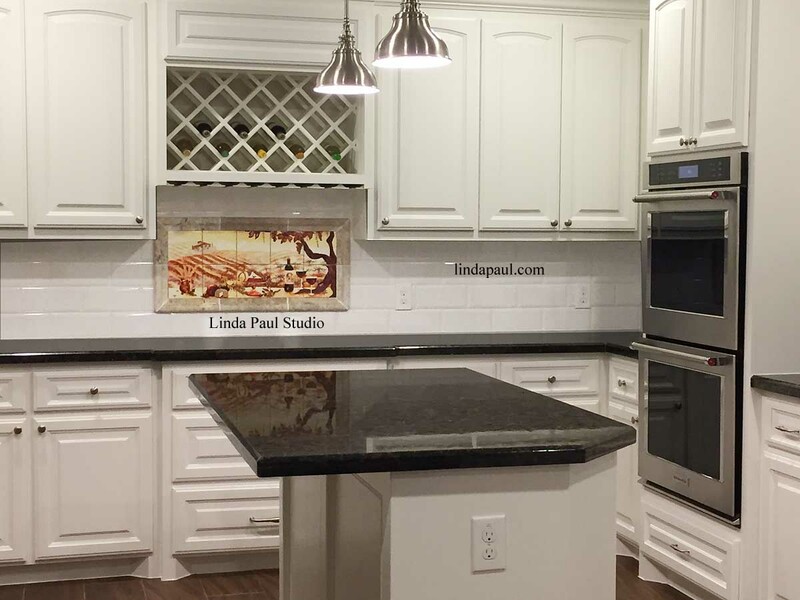 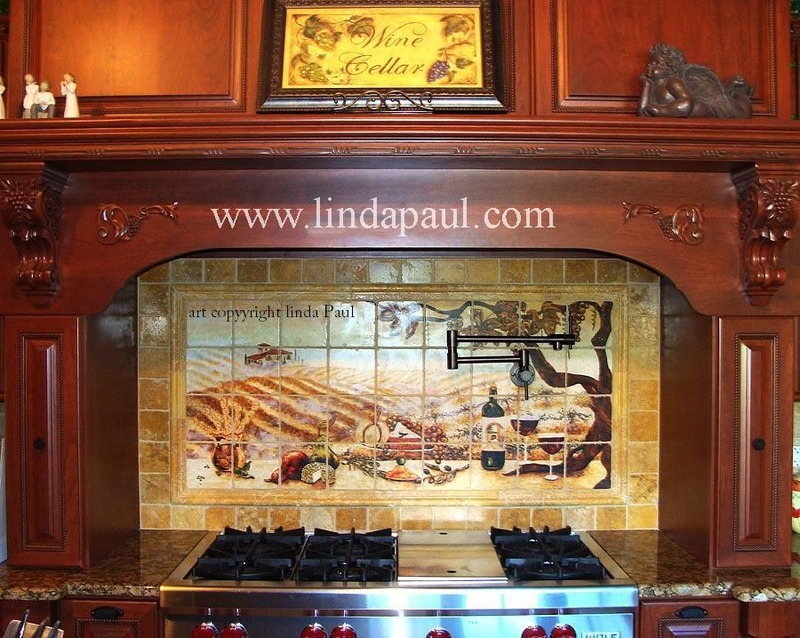 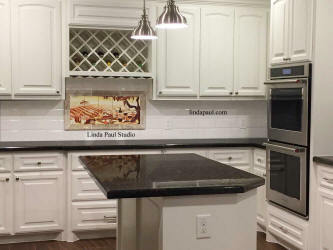 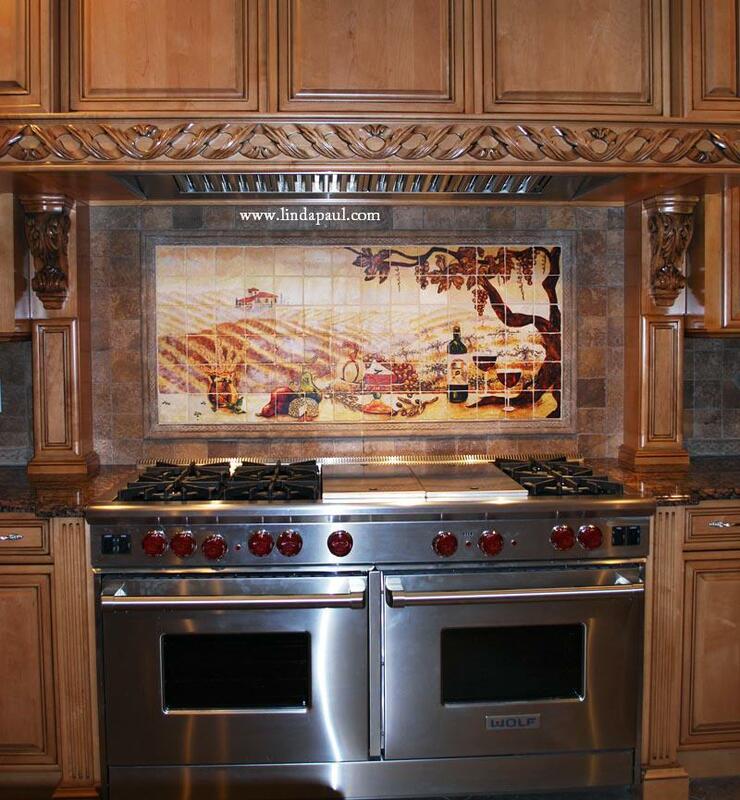 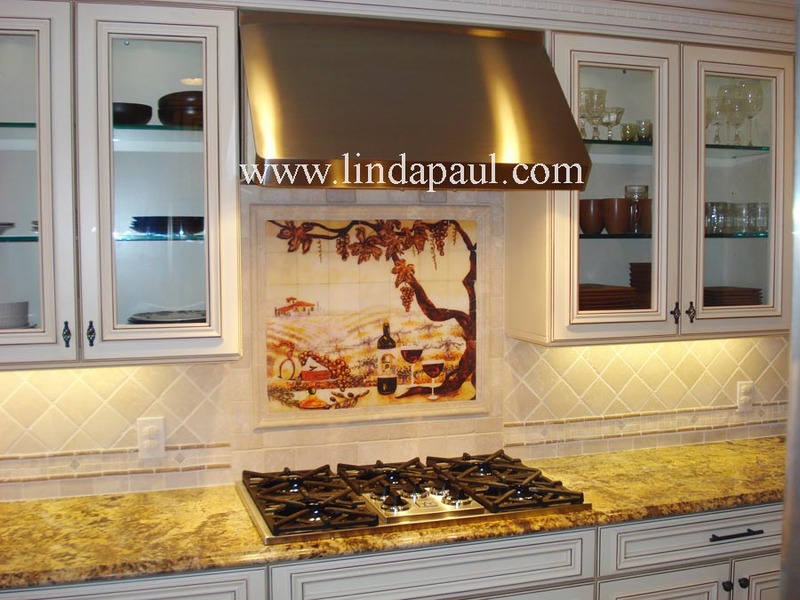 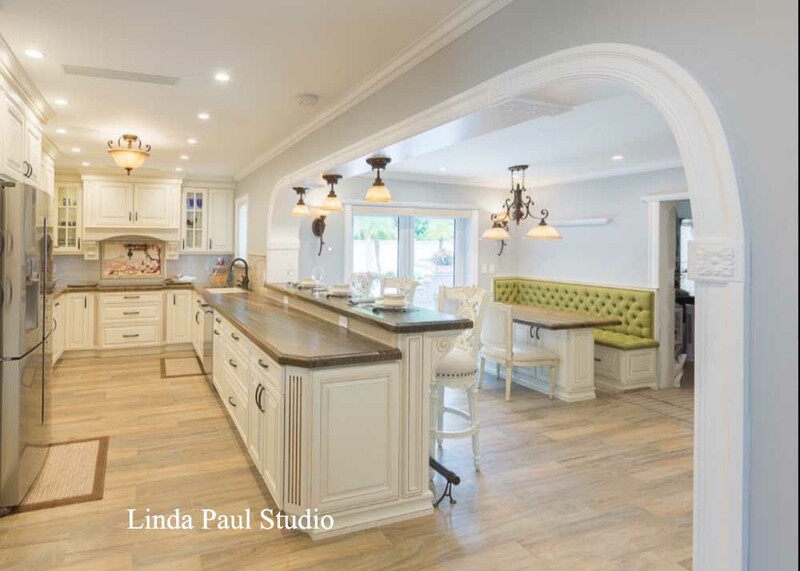 The customer loves it and wrote, " Hi Linda, I am delightful with the beautiful tile art you made for me,"
This kitchen renovation features The Vineyard tile mural backsplash by artist Linda Paul. 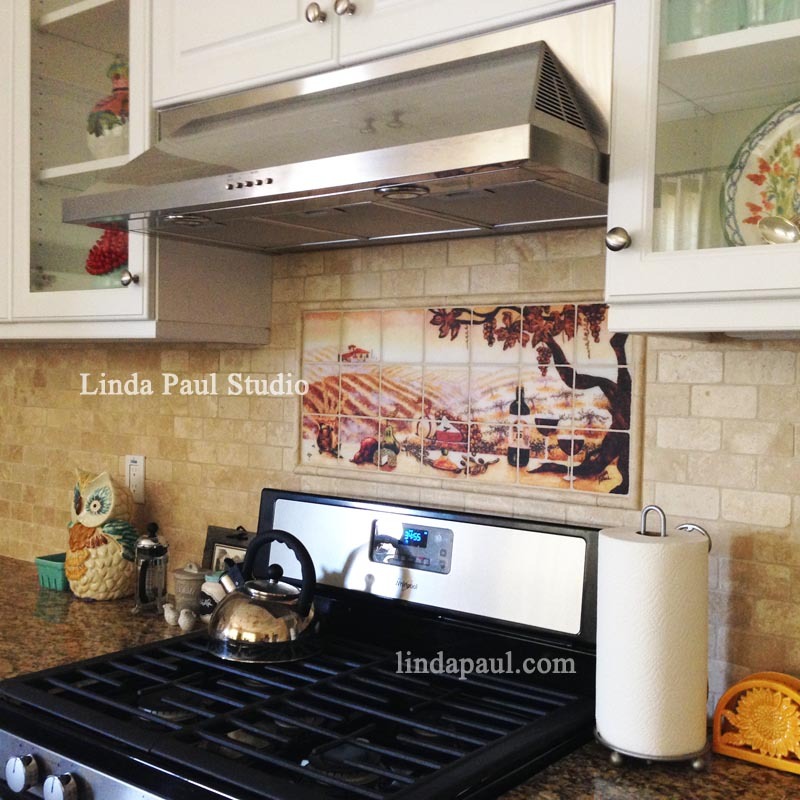 It really helps this small kitchen have a focal point and beautifully enhances the neutral color palette. 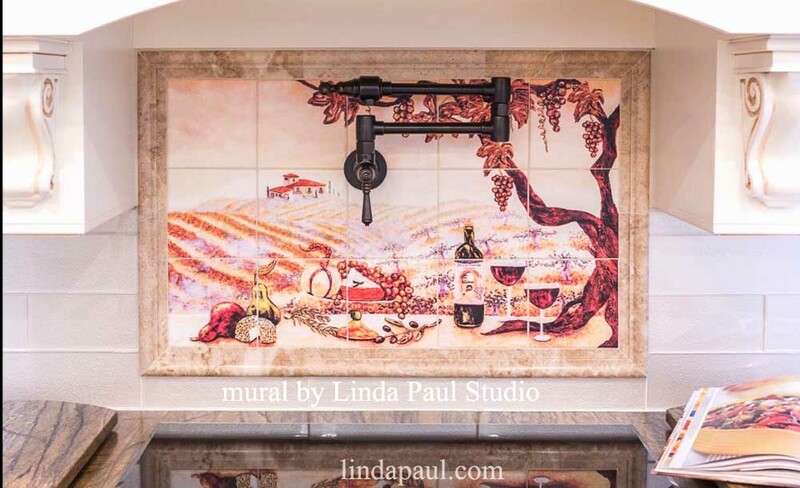 Stunning custom kitchen and installation of our Vineyard splashback mural. Wow! 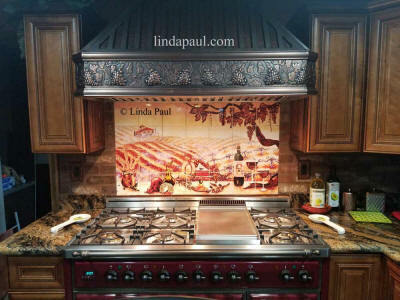 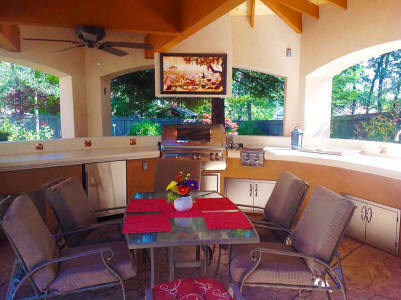 Just say WOW to this celebrity kitchen belonging to JWOWW from Jersey Shore with Linda Paul's Vineyard mural backsplash. 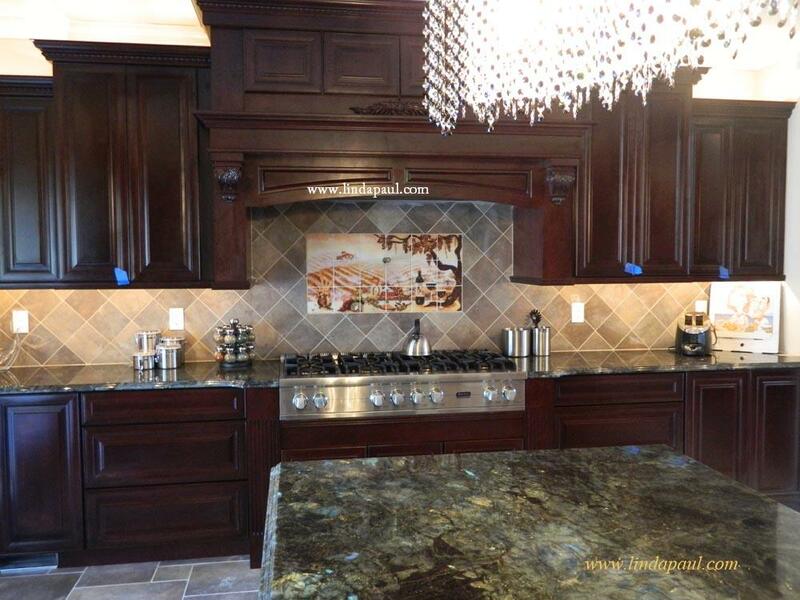 Love the cabinets at different heights, the green granite and beautiful light fixture. 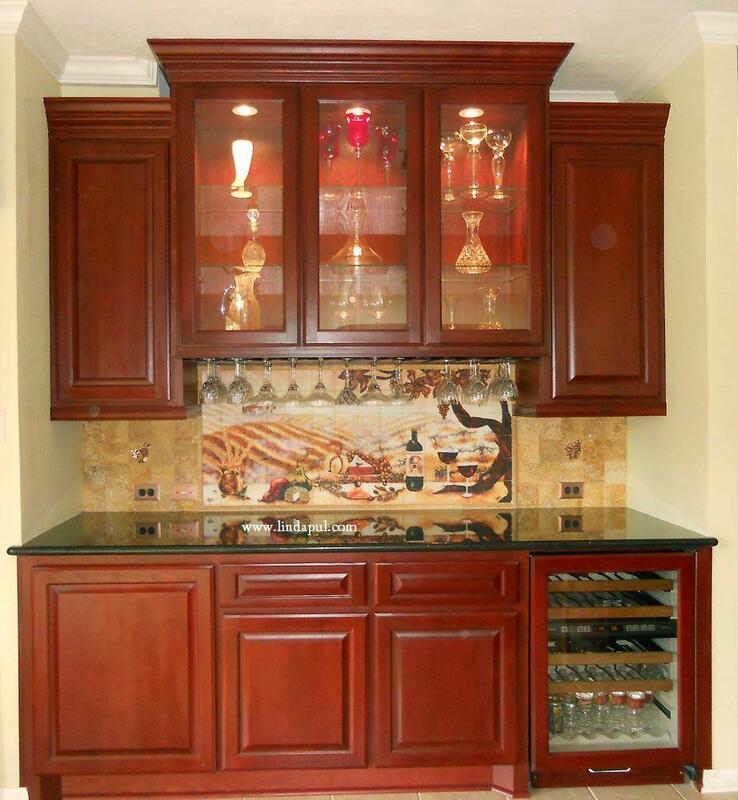 Mural size is 36" x 18"
Very pretty installation of our Vineyard mural set in gold travertine tile and framed in wood that matches the cabinets. 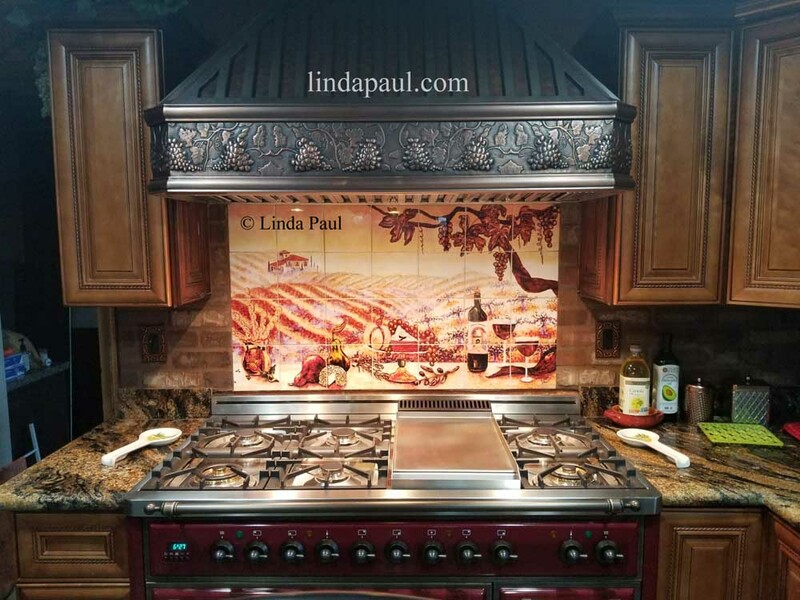 There's a nice little grapevine detail on the cabinet below the cooktop. 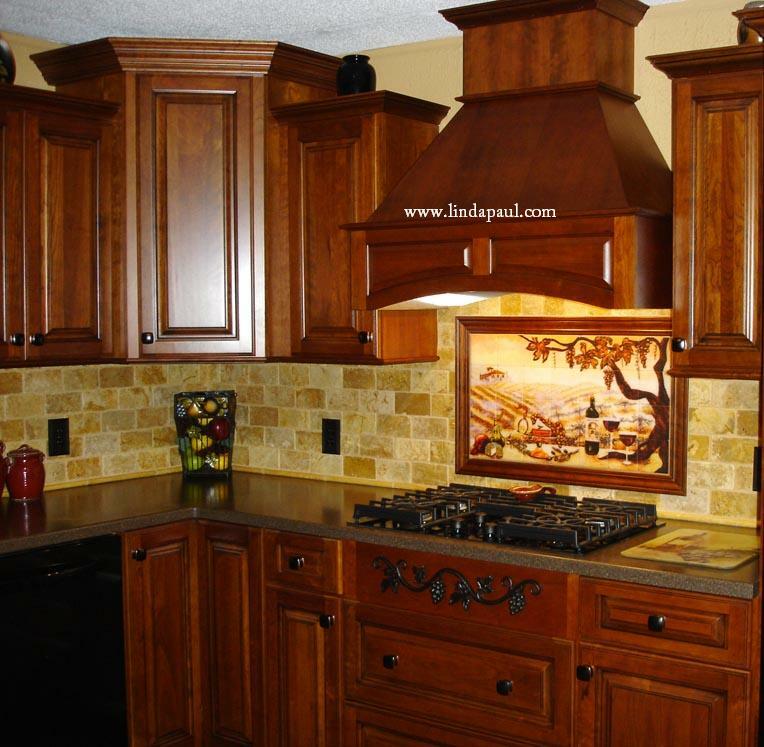 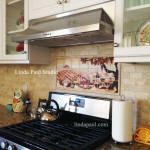 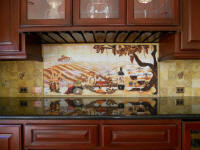 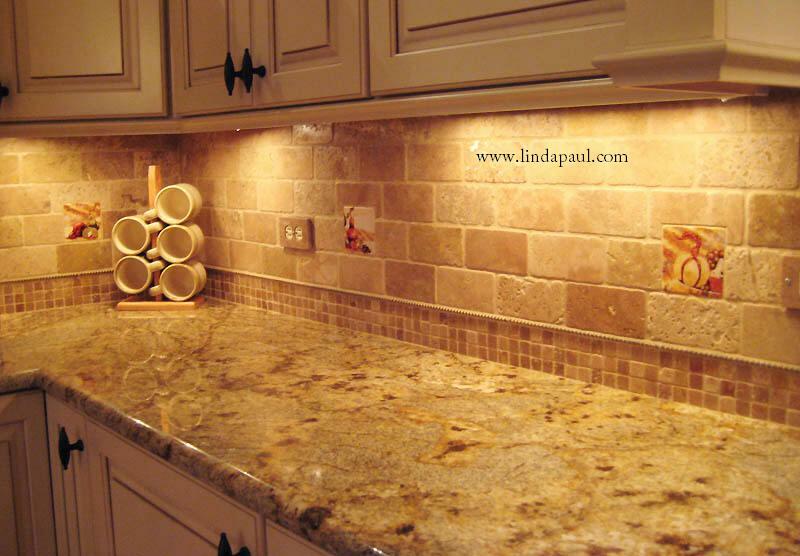 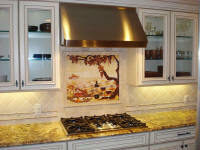 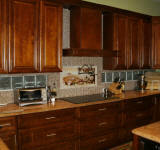 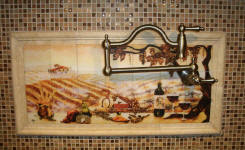 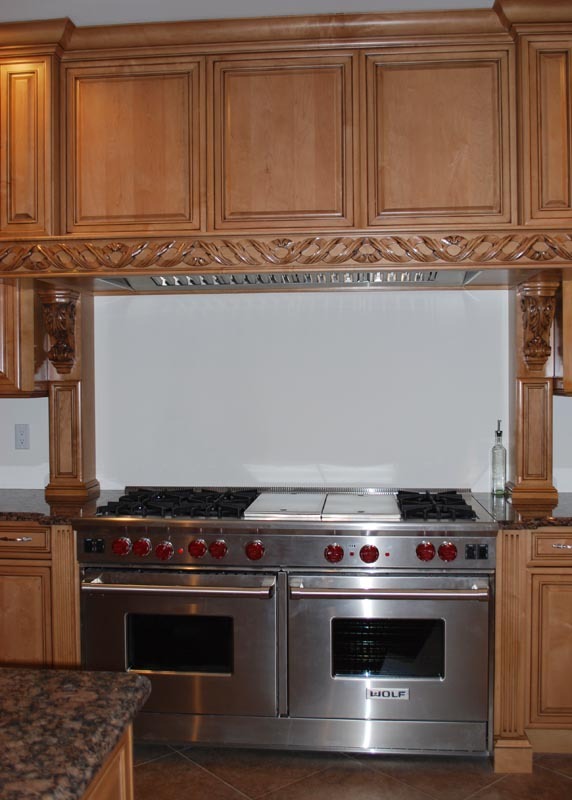 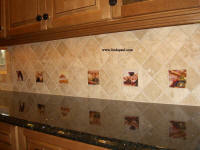 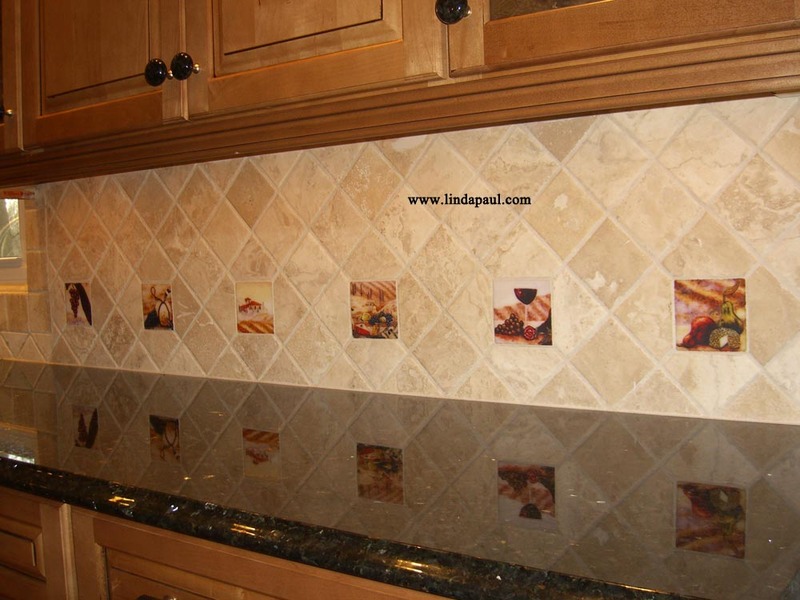 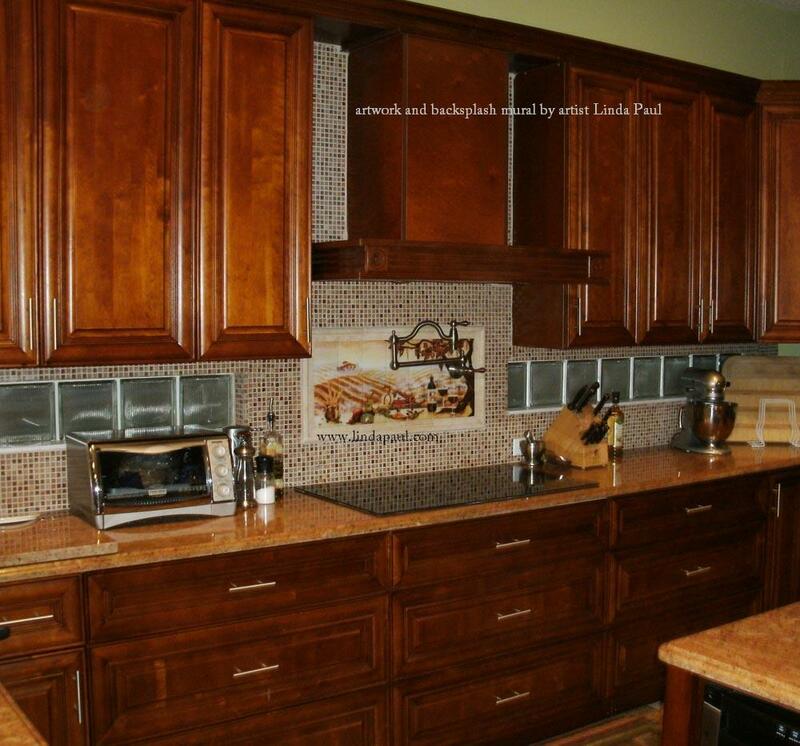 Read reviews and comments from other customers who purchased a kitchen backsplash mural. 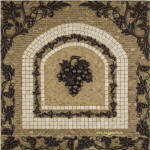 Picture shows The Vineyard size 28x12"
Dimensions are given as length first, then height. Don't know What Size to Order? 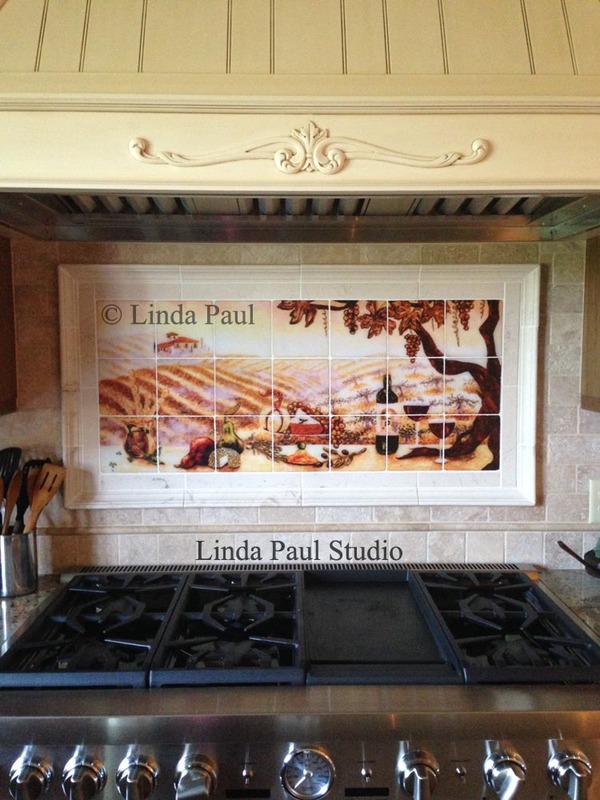 If you are not sure which size of backsplash mural to order, just email us a straight on picture or design drawing of the space you have for your backsplash and we can tell you which is the best size for your space. 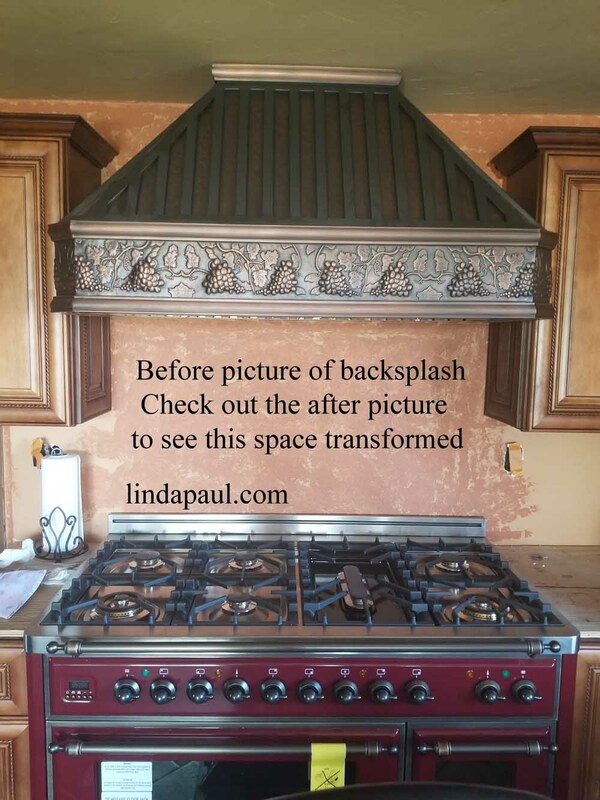 Be sure to include all dimensions. 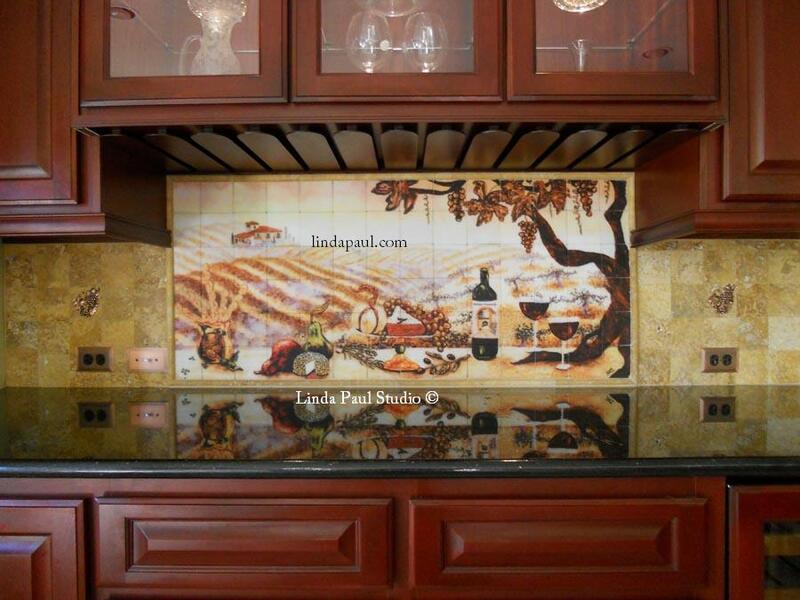 We can design the perfect backsplash mural just for you! 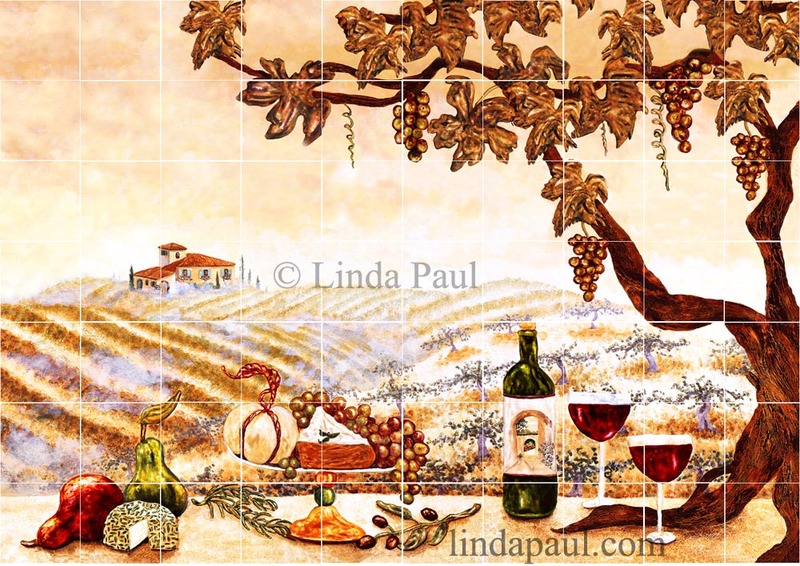 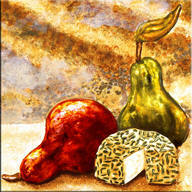 Artist Linda Paul is an expert in designing her images to fit your space perfectly!